Hi, I just purchased the book and am on day 5. Two quick questions - I couldn't find canned organic coconut milk without guar gum. Do you have any brand recommendations or do I not need to worry about guar gum? Also, I am traveling for 36 hours and will be staying at a hotel. Should I bring all of my own food? Any recommendations for travel-friendly foods or recipes since I'll be on a plane and then at a hotel? I see nightshade spices on the "no" list, but am just thinking unless I see it on that list its OK? Like rosemary is not on the list but is involved with the roasted chicken. I'm wondering about dill, lemongrass. Pacific makes an organic bone broth with rosemary, cider vinegar and lemon grass. Wondering if I can drink that. I am only on phase 1, but have not been drinking chicken stock, as it seems like a waste of chicken I can't eat. Hi! I do not see salt listed in the lists, but pepper is. The recipes in the book contain salt. What is the rule for salt? Sea salt only? Is all salt ok? Thanks! Hi Dina! Thanks so much for this question. We like sea salt. If you have not tried it yet, Redmond Real Salt is exceptional. Here is a link to check it out. http://amzn.to/1OciofF This is a sea salt that has never seen modern conditions as it comes from an ancient sea bed that was buried in Utah. The trace element content is such that it has less of an effect on elevating blood pressure and has an almost sweet aftertaste. We prefer this salt over all others but a good himalayan pink salt can work too. Enjoy! Im on day 6, and i still have diarrhea, maybe its the grains/beans? Why isnt grains their own category to eliminate and test??? Also when is the best time to take charcoal? Like in between meals, in between supplements? I know Turkey and chicken is ok on this diet. We have the book. We are wondering if duck is ok.
Hello I am about to embark on the elimination diet. I was wondering if you support an online forum for discussion / questions ? Or if you could recommend and existing forum that might be well monitored by knowledgable professionals. When can kiwi be reintroduced? I'm on the first week of phase 3, but don't see anything for kiwi anywhere. Help! Ive lost your website with you recipe and how to lists! Hi, I was wondering if products like Eat Water: Slim Rice/Pasta are suitable for the Elimination Diet, and if they are should they be included at phase 1 or 2? I haven't had grains such as rice for some time, having replaced them with this instead, though they do contain a small amount of oat fibre. Seeing as grains are on the No list for phase 1, I had thought to add slim rice to soups and smoothies instead, as it's based on a vegetable rather than a grain. There are other brands such as Bare Naked Noodles but as those contain soya I assume they wouldn't be ok. Please advise, I am very curious to know. Thank you. Hi, I had a blood test to see my food allergies a year and a half ago saying I'm allergic to both wheat and peanuts. These have been removed from my diet since then, so I'm wondering if I should try reintroducing them into my diet for phase 3 despite knowing I'm allergic? My reactions are skin based, not deathly, so doing so wouldn't kill me, but I'm curious to see if I'm still allergic after all this time. Hello, I was wondering if Mangos are allowed because I haven't seen them on any of your list, thank you. Hi Nathalie~ Mangos are allowed during all phases. Enjoy! Can store bought Pacific brand organic brothes and stocks be used, in lieu of homemade batches? I'll be starting the diet after Thanksgiving. 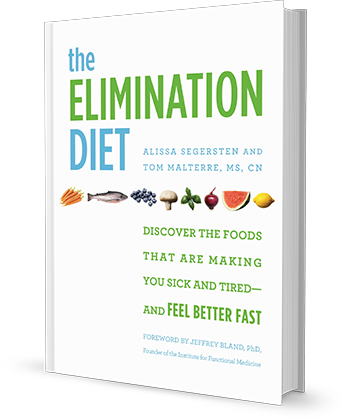 Hi Tom and Ali, I am currently reading your book " The Elimination Diet " and loving every page of it ! It has so much of information and while reading it I am feeling ...why didn't I get this earlier ! I am preparing myself for Elimination Diet. I read in the book about benifits of Broccoli Sprouts and would love to include them in my diet...however where I stay we dont get its seeds ...I even searched on Amazon and the seeds available are not organic. Could you please tell me about broccoli sprouts supplements and which brand should I buy ? I understand that best way to have nutrients is have fresh sprouts however due to difficulty in availability of organic seeds I want to take supplements. Please help. Thanks. Hello - trying to get my shopping list together to begin the elimation diet. I see that coconut milk (canned,organic) is allowed. Is coconut milk in the carton allowed (often found in refrigerated sections of grocery stores next to the Almond milk and soy milks)? Hi , Please can you clarify if amaranth is allowed on any phases of the diet? Can I eat certified gluten free oats on phase two of the diet? My wife still has hemorrhoids. We are on day 15. Any ideas? The elimination diets all seem to include in the ok for phase one food something I already know I have a problem with(broccoli) with that knowledge is it safe to assume any of those ok foods are actually ok?